In this audio episode of The Handyguys Podcast Brian and Paul discuss tractor maintenance and how to winterize your lawn and garden equipment and store your Deere tractor for the winter. Check your owners manual for specific end of season or storage procedures. This show will primarily focus on Fuel. This guide applies to all small engines including tractors, mowers, string trimmers, chain saws, blowers, etc. IMPORTANT: Avoid damage! Stale fuel can produce varnish and plug carburetor or injector components and affect engine performance. This issues is compounded by a fuel additive called Ethanol. The Ethanol can attract moisture which contributes to the issues. 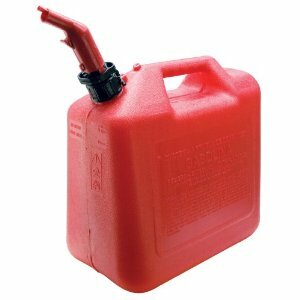 If possible use non-ethanol fuel in your small engines but still follow these procedures. The end of season procedures are different depending on if you have been adding Fuel Stabilizer to your fuel or not. Add stabilized fuel to tank until the tank is full. NOTE: Filling the fuel tank reduces the amount of air in the fuel tank and helps reduce deterioration of fuel. 1. Park machine safely in a well-ventilated area. NOTE: Try to anticipate the last time the machine will be used for the season so very little fuel is left in the fuel tank. 2. Start the engine and allow to run until it runs out of fuel. If you have a significant amount of fuel left you may want to consider draining the tank. The procedures for tank draining can be found by clicking on this picture. John Deere has provided The Handyguys the products used in this evaluation. However, the opinions of The Handyguys are entirely our own and we have not been paid to make positive comments. It’s interesting to hear this conversation. I just planted our winter lawn last week. It’s 2-3 inches tall already and about ready to be mowed for the first time. I just got my mower back from the shop, where they sharpened the reel and tuned it up for the winter season. Here in the Phoenix area, October thru May is our time to enjoy the outdoors. I usually let the lawn go dormant in the hottest summer months, since it requires so much water to keep it green. So, it’s interesting to hear what you have to do in other parts of the country. Thanks for the info provided in the podcast. Filling the lawn mower engine with stabilized fuel does help reduce air intake in the engine which causes fuel deterioration. Good post. Thanks for taking the time to comment. You reminded me, we should do a show on chainsaws sometime. Great article on how to take care of your tractor at the end of the season! I’ve heard so many horror stories of people who leave their tractor full of gas during the winter season AND out in the cold. Then they wonder why it wont start in the spring when they need to cut their grass.